This network type is used on networks that have no broadcast/multicast capability, such as frame-relay, ATM, SMDS, & X.25. The key point is that these layer 2 protocols are unable to send broadcasts/multicasts. To show how critical this is, please see the diagram below. 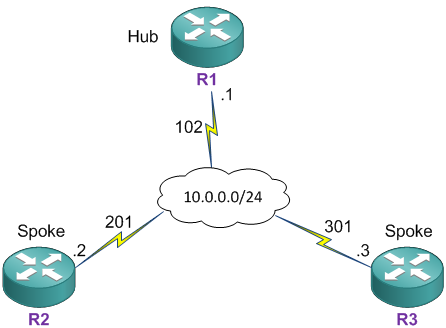 – In the top (Ethernet) network, if R1 wanted to send some data to R2, then R1 would send a broadcast ARP with a layer 3 destination of 10.0.0.2 in order to discover the mac address of R2’s Fa0/0 interface. R1 would then forward the data to this MAC address. – In the second diagram (Frame-Relay) R3 is unable to send that broadcast ARP (like we could in the Ethernet scenario above). MAC addresses are only used on Ethernet networks, whereas Frame-relay uses the concept of DLCI’s at layer 2. 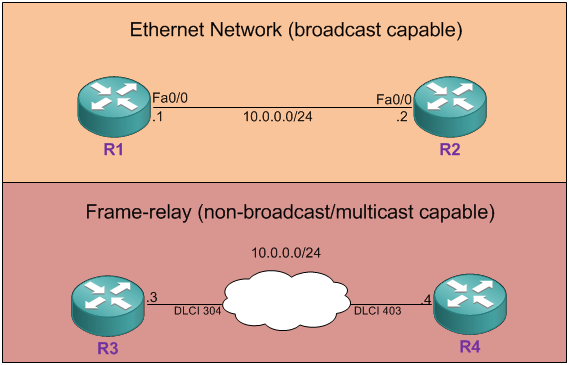 So R3’s WAN interface must be statically configured with the layer 2 DLCI that it needs to use in order to reach R4 (commands such as #frame-relay map ip 10.0.0.4 304, or #frame-relay interface-dlci 304 (if using inverse-arp) could be used to achieve that). The point here is that it is not possible to send any layer 2 broadcasts across a frame-relay network. The OSPF Non-broadcast network deals with this kind type of network by unicasting all types of OSPF packets (eg: Hellos, LSA’s, LSU’s etc), over the frame-relay network instead of multicasting them. Let’s step through an example topology (below). The hub, R1, is going to be the DR, and the other two routers are spokes. The key thing to remember is that the neighbor command is restricted to the DR & BDR only . If you try and configure a neighbor statement on a DROthers router, the parser will accept the command, but the #sh run output will not display the neighbor statement. The neighbor command allows the router to send hello’s to those specific neighbors. Those messages are sent as unicast messages. The reason the neighbor command is only required on one side between neighbors, is because hello’s are sent if hellos are received. Hello’s are sent every 30 seconds by default on this network type, or upon receiving an hello packet. So therefore, hello’s will be able to be exchanged between the two neighbors. In the config you will also see I’ve opted to exclude the “broadcast” keyword on the end of the frame-relay map statements (more info on that topic here). The reason being, there is no broadcast/multicast traffic sent by OSPF on this network. I’ll show a packet capture on R1’s s0/0/0 interface, and you will see the OSPF messages are sent as unicast packets as opposed to multicast packets. I’m gonna add a new network into OSPF so that you can see everything is sent as unicast messages. Below is the packet capture taken at the same time this configuration was applied. So as you can see. All IP address in the destination field are unicast for all types of OSPF packets. This won’t actually cause R2 and R3 to become OSPF neighbors, however, it will allow traffic to go directly between them rather than via R1. It’s important to remember that only the DR/BDR are able to create OSPF neighbors and adjacencies to the other routers. So it’s not possible to create the OSPF adjacency between R2 & R3 unless we remove the #ip ospf priority command and configure a priority greater than 0 on one of them. This will allow one of the routers to be elected BDR, and thus allow the adjacency to be formed. What I mean by adjacency and neighbor by the way, is that in this network type, all the DROthers will create a DR/FULL relationship in the #sh ip ospf neighbor output. Whereas a DROther to DROther will stay at 2-way. The reason why is because with OSPF, there is an assumption made that if you can reach the DR, then this implies you can also reach any of the DROthers. The idea is that you no longer need to create P2P relationships with every single DROther router, thus significantly reducing the number of OSPF neighbor adjacencies that are required. Instead the DR creates just one type 2 LSA that represents that entire part of the network.